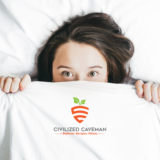 There are so many things going on behind the scenes at Civilized Caveman headquarters now and I am going to share a few before we get to this delicious butternut squash recipe. We started an exclusive private Facebook Group that is AMAZING. THE PALEO KITCHEN IS OFF AT PRINT!!!!!! Can you tell I am excited. The level of pride and love I have for this book is beyond reproach. Twelve months of amazing work is about to pay off and be in our hands. I poured so much love into this book that we can't wait to share it with you. I absolutely love butternut squash and am ashamed to say I had never eaten it before I went Paleo. I have a ton of butternut squash recipes on my site now and have a feeling that number will continue to exponentially grow. It is the most versatile ingredient ever that tastes amazing. You can make brownies, soups, hashes, etc and the flavor combinations are endless. Just sitting here, I realized that there are probably thousands of ways to enjoy this heavenly ingredient that I may be missing out on. Leave me a comment below with your favorite recipes or ways to eat butternut squash so I can get to trying them. This recipe is one of those weeknight classics that can be made in huge batches and snack on through out the week. You can serve it with chicken, beef, seafood or even eggs. My favorite thing so far has been making scrambled eggs and serving this on the side as a hash. All too often we over complicate meals or think they have to be difficult, the truth is the simpler the better. Enjoy this recipe and I can't wait to read your comments. I made this yesterday for a Christmas Potluck. Delicious! Two issues I had…the dates tended to clump together. And I think 20 minutes at 400 might be too long…my squash was mashed squash by the time I mixed the dates and pecans in…no cute little squares left (used precut from Trader Joes). Suggestions? Thank you! That always happens with my dates as well and I haven’t found a good trick yet. For the squash, using the precut would definitely make a difference since it would be less moist having been cut for a while. Maybe just cook for 12 minutes and then check occasionally until you are happy with the texture. I love this recipe. I have made it in the past but tonight I was out of pecans so I am substituting pumpkin spiced almonds. It smells divine and I will have to let you know how it tastes. I found it to be way too sweet. It was unbalanced. After dinner, I usually want something sweet but I found myself hunting for something salty! I like the texture and idea of it but next time I make it I am going to reduce the maple syrup, reduce the dates by 50% and add bacon to balance it out. I was also thinking some crispy sage might be nice. I will also try the reduced sweetness version for breakfast with a fried egg on top. Obviously, the recipe is not a deal breaker but I’m the one everyone I know would point to as the sweet tooth and for me to think something is sweet was shocking even for me. I could see it for Thanksgiving where you just have a little bit with a bunch of other stuff but as a main side with your dinner I would suggest that modifications to the sweetness be made in order to be able to eat enough to be full before you get the sugar shiver. Thank you for all the awesome tips. I loved sweet when I made this and that all makes sense. I made this for a Thanksgiving carry-in at work today, and it was fabulous! Everyone really liked it. It was exactly what I was looking for, and I will definitely make this again! Thanks for this one — trying a variation of it tonight! And FWIW, it seemed to be the only recipe like this on the internet. Pretty amazing. This recipe is so, so good with pretty much anything. With meat for dinner and then with my eggs the next morning. Haven’t done butternut with dates although the maple has been a favorite. yum! Love maple and butternut together. Enjoy! This is the best butternut recipe ever. I use the precut squash from Trader Joe and it only takes a few minutes to get this assembled. Think it might be good with some crumbled bacon too. Thanks so much :) and thanks for the feedback. Yum! I love butternut squash and this sounds amazing. I would probably add some bacon… just because…. I am thinking it would make a great breakfast dish with some eggs. This sounds awesome, I’m going to make this for Easter Dinner for sure! Thanks! OMG! That is all I can say about this recipe. I have an over abundance of butternut from my garden this past fall. Why, oh why, did you not post this recipe earlier ? ? ? ? ? Hahahaha, I am sorry about that. But I am glad I finally did! OMG! That is all I can about this dish. I had a surplus of butternut squash this year and why or why did you not publish this earlier??????? Cannot wait to make it again. I’m happy to hear it :) sorry it took me so long! Thanks so much for including the gram weights…love that! This recipe sounds delicious! You are right, we often over complicated meals when we don’t need to! I just bought pre-cubed butternut squash for the first time last week (I’ve only ever bought the squash whole and baked it). All of those recipes from all of those blogs sound awesome, I have made some already :) thanks so much for the tips. Let me know what you think of the recipe!